Our family has decided to have a “no sleepover” rule for our children, and I know this is the trend for a lot of parents these days. I enjoyed sleepovers a lot as a child, so I decided to compromise and allow my kids to have a late-night pajama party instead. Everyone gets to come in their jammies, bring their sleeping bags and pillows, stay up late to watch a movie, and then go home to sleep in their own beds. I think this makes things safer and more comfortable for everyone. Since no one is staying the night, I thought it would be fun to still have breakfast, but for dinner. 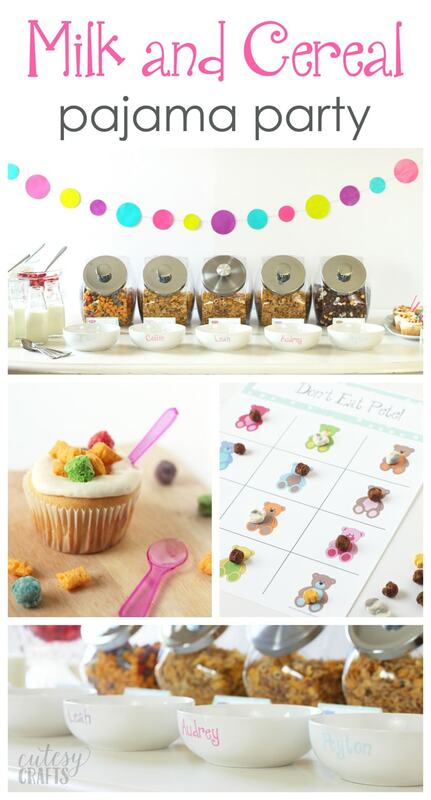 Everyone loves a good bowl of cereal, so I created this fun Milk and Cereal Pajama Party using Post cereal! I headed to Walmart to pick up some Post cereal to have at the party. I got a nice variety to make everyone happy. 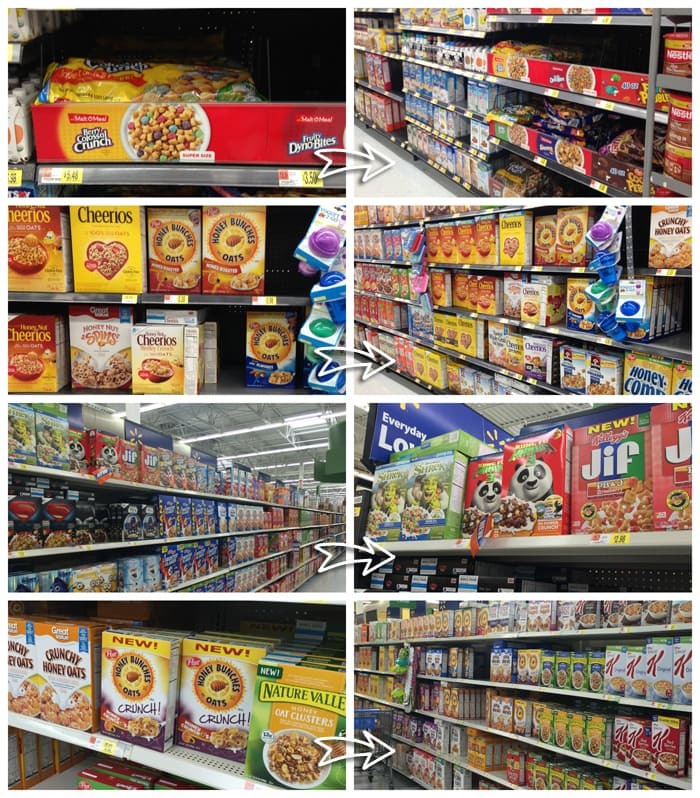 Right now, you can earn $.50 when you buy any Post product at Walmart with Ibotta. Find out more about this offer by clicking here. I got five different kinds of cereal; Honey Bunches of Oats Honey Roasted, Honey Bunches of Oats with Almonds, Honey Bunches of Oats Honey Crunch O’s, Kung Fu Panda 3 Po Power Crunch, and Berry Colossal Crunch. 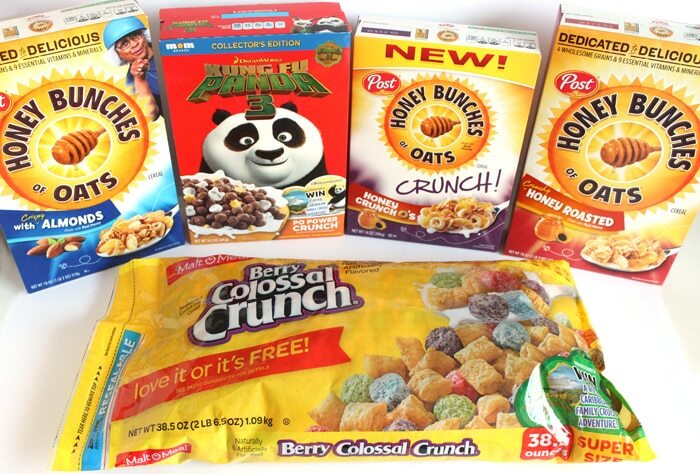 The Crunch O’s and Kung Fu Panda cereal are new, so I was really excited to try those! I filled some glass penny candy jars with the cereal, which made it easy for the kids to scoop it out on their own. 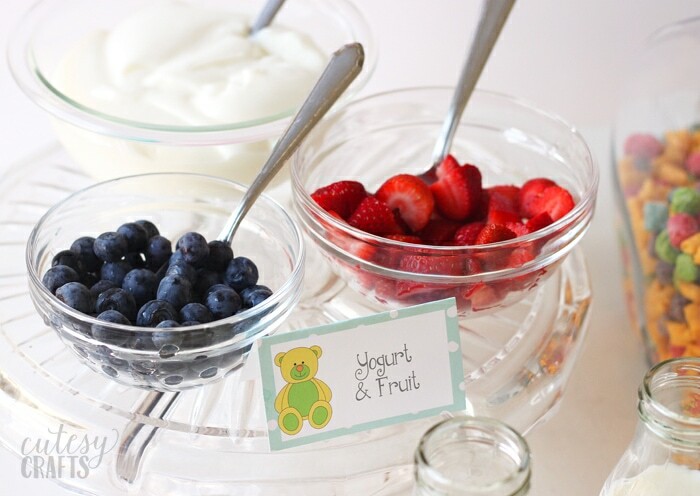 We also had fruit and yogurt as an alternative. Each child got to use a small glass milk bottle to pour milk into their cereal. This definitely helped avoid spills, and looks super cute! You can find these at the craft store. I also got each of the kids their own bowl to take home. I personalized them with some permanent vinyl. If you don’t have a vinyl cutting machine, you could also write names on them with an oil-based permanent marker and then bake them to set in the color. 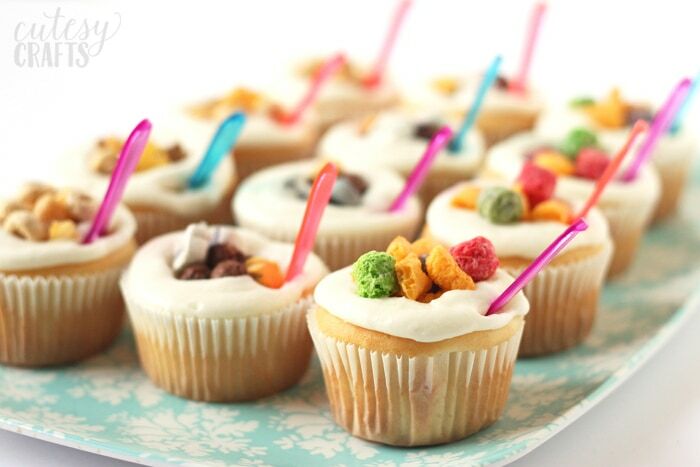 To go along with the “milk and cereal” theme of the party, I made these cute “bowl of cereal” cupcakes. 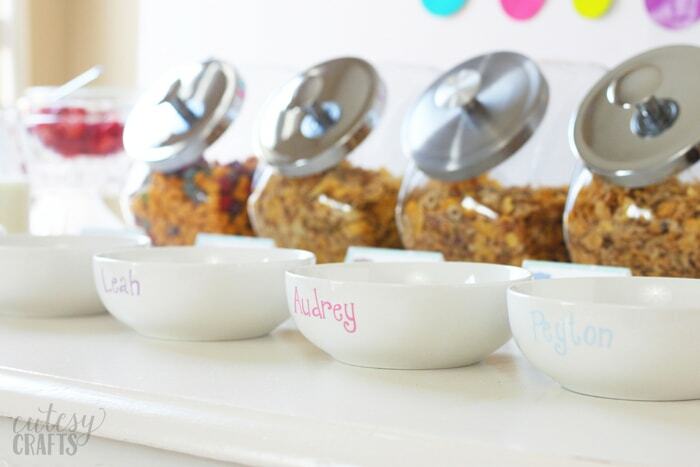 Each one has a small sample spoon to make it look like a real bowl of cereal. It’s really just for decoration, but the kids enjoyed eating the cereal out of the top with the spoon and then eating the cupcakes. Bake your cupcakes according to package directions. 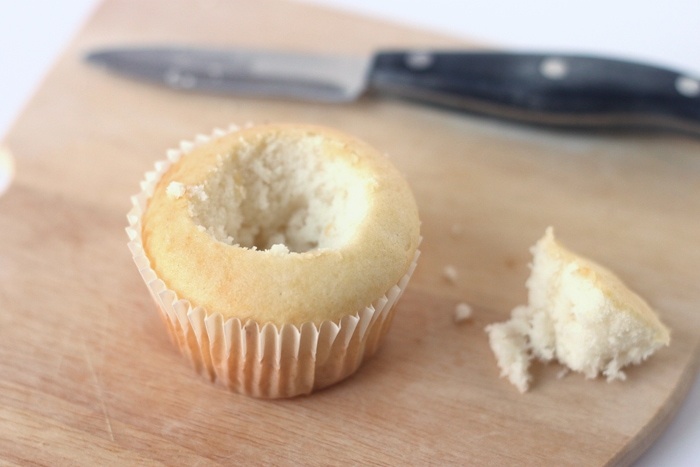 Allow them to cool and then cut a well in the center of the cupcake like below. Beat butter with an electric mixer at medium speed until creamy. Add sugar, and beat until smooth. Beat in vanilla and 3 Tbsp. of milk. 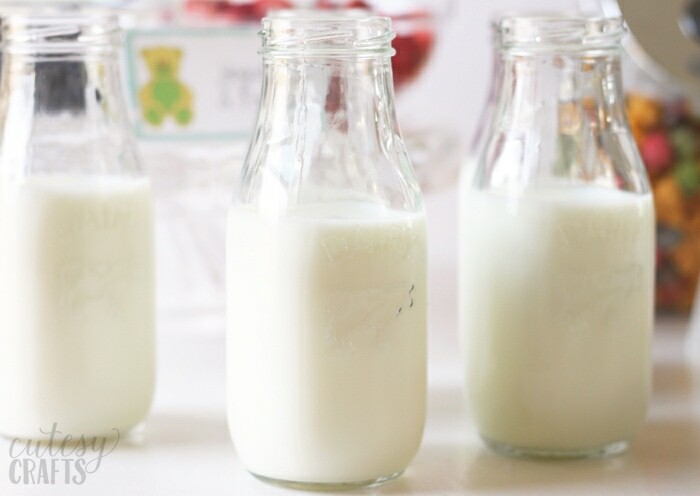 Add more milk until desired consistency is achieved. Pipe two rings of frosting around the top of the cupcake, and a small dollop in the middle. 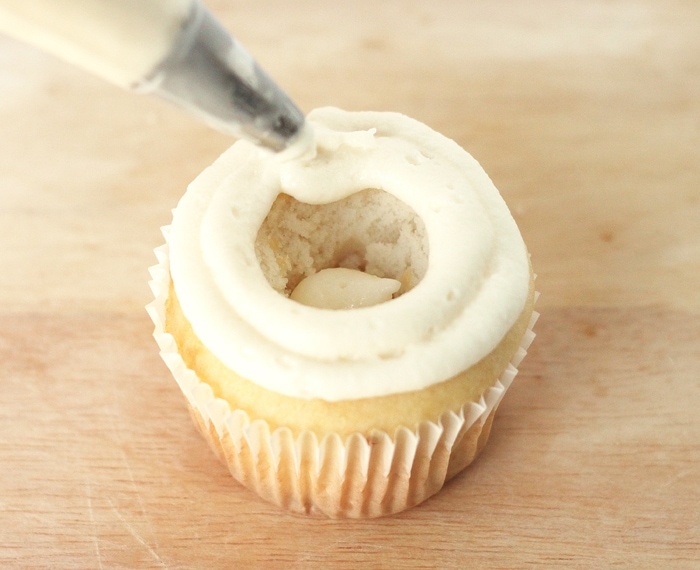 If you don’t have any frosting piping supplies, you can also just cut a hole in one corner of a plastic baggie. 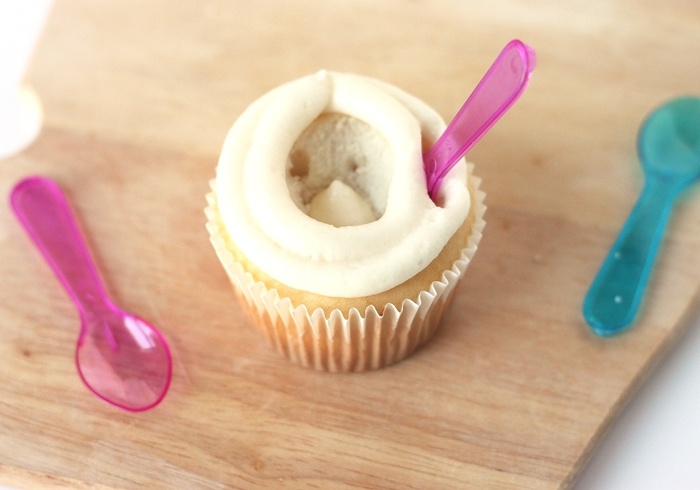 Insert a small sample spoon into one side of the cupcake, and allow the frosting to harden a little. In case you are wondering, I bought these spoons online. 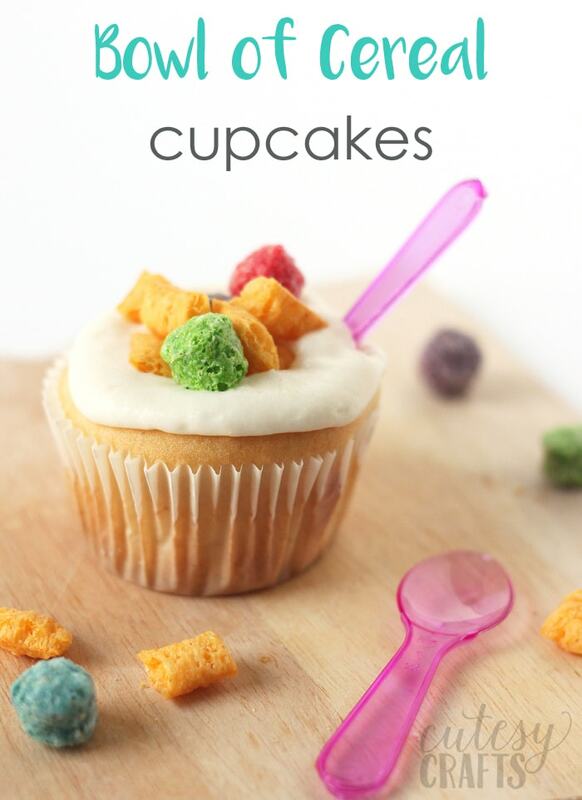 Add cereal to the inside of the cupcakes just before serving, to maintain freshness. I made three different kinds of the cupcakes, using the Berry Colossal Crunch, Kung Fu Panda 3 Po Power Crunch, and Honey Bunches of Oats Crunch O’s cereals. 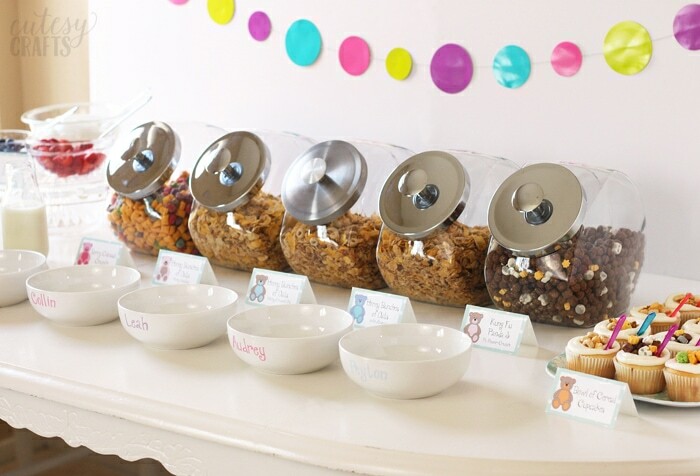 You can use any of the cereals that you bought for the party. 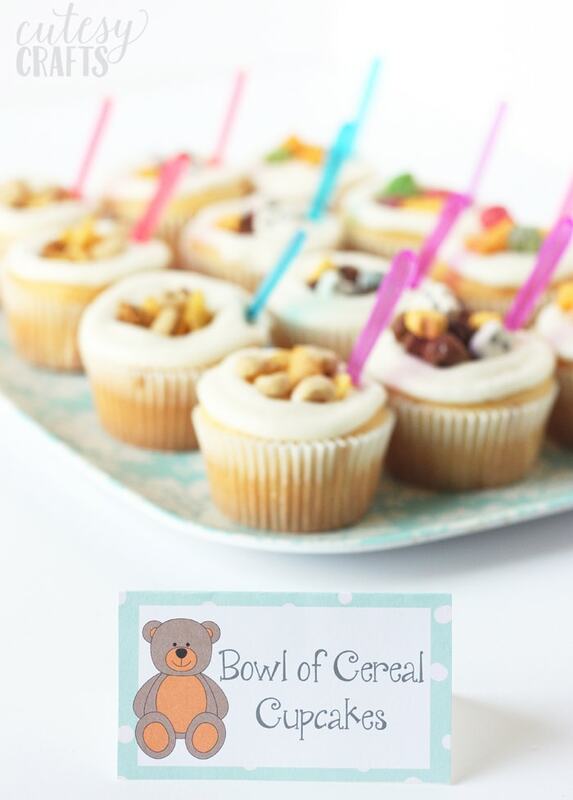 My kids liked the Kung Fu Panda cereal cupcakes the best. I made some free food printables for you to download. You can get those by clicking the link here. The cute little teddy bears match the pajama party theme! You can download them with or without words, and I even provided some without the bears. 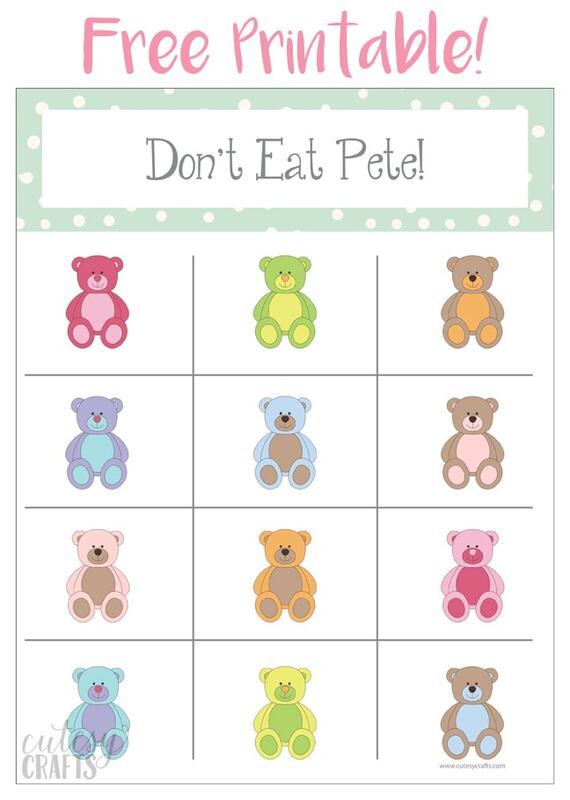 We played a fun game at the pajama party called, “Don’t Eat Pete!” Here is a free printable for that. If you’ve never played “Don’t Eat Pete!”, I’ll give you the rundown. 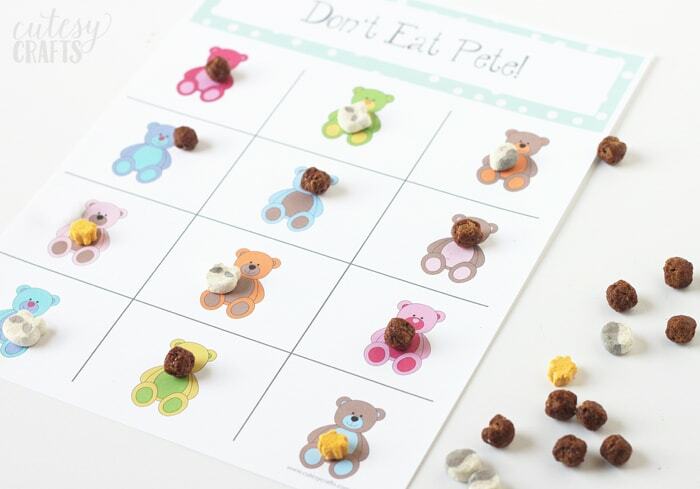 You put a piece of cereal on each of the bears. We used the Kung Fu Panda cereal since it had little bear marshmallows in it. Perfect! One person goes in the other room, so they can’t hear or see what’s going on. The remaining children choose one of the bears to be “Pete”, and the person in the other room returns. That person eats one piece of cereal at a time off of the board. When they get to the bear designated as “Pete”, everyone yells, “Don’t eat Pete!” Then it’s someone else’s turn. 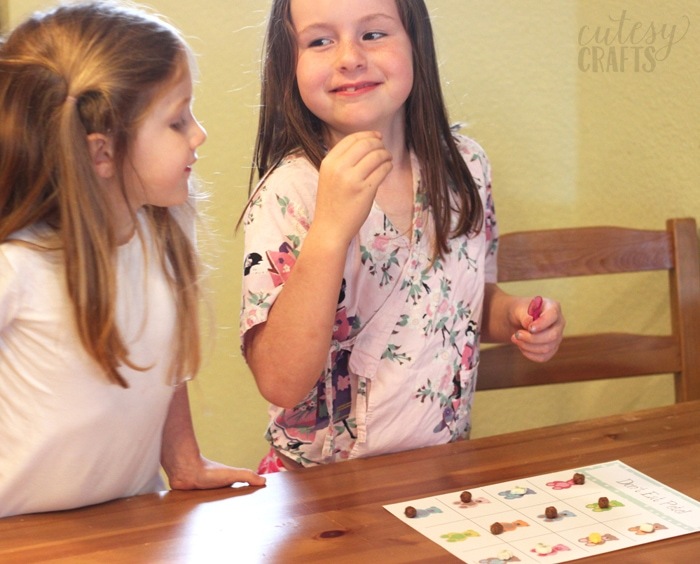 The game seems so simple, but my kids had a blast playing it! The anticipation of not knowing which one was “Pete” was so fun to watch! 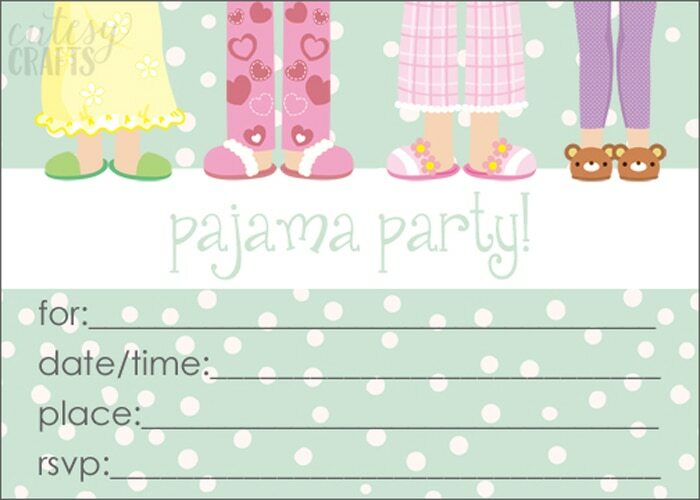 And last but not least, I made this adorable free pajama party invitation printable for you to download. You can get this and all of the other pajama party printables by clicking here. A successful pajama party, if I do say so myself! Do you allow your kids to go to sleepovers? What do you think of my milk and cereal pajama party alternative? I’d love to know in the comment section below. Also, be sure to check out the new Post cereals and Ibotta offer. Thank you Pam! The kids had so much fun!